We’ve already talked about the best hair color for blue eyes so it only makes sense that we now take some time to talk about the best makeup for blue eyes. If you’ve been following our eye makeup series so far, you already know how to properly apply eyeliner, mascara and eye shadow and you already know how to make your eyes look bigger and brighter. Now it’s time to get into what makeup is best for blue eyes and how you can apply it to make your baby blues look their best. Before we start talking color and technique, we need to talk about the basics. 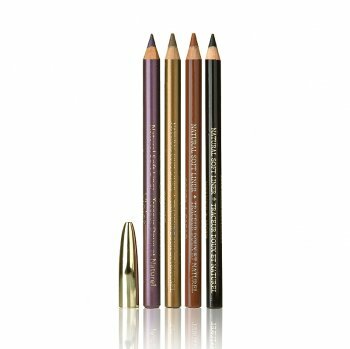 Enhancing blue eyes is all about subtle colors, focus on the lash lines and a strong brows. The problem with blue eyes is that there are a lot of misconceptions out there about what works on blue eyes. Let’s get into those now. Myth: Black mascara isn’t an option. Truth: Black mascara can work on blue eyes when applied properly. What you need to be careful of with black mascara on blue eyes is drawing attention away from the color of your eyes. You want to make the blue pop, not make it look dull. Standard black mascara applied properly can create a beautiful contrast between the blue of your eyes and the black of your lashes. That contrast makes your eyes the focal point of your face – as they should be. Your eyes will look brighter and more open as well so to sum it up, black mascara is most definitely an option for blue eyes. Myth: Blue eye shadow should be banned from your makeup palette. Truth: This one is a big giant no. A bright blue shadow above your blue eyes will draw more attention to your eyes and make them look bright and vibrant. Pale blue shadow also works although it gives it a softer, more muted over all look which can be beautiful. You don’t just have to stick with basic blue shades either. Turquoise also looks beautiful with blue eyes. We’ll talk about more colors you can use and how to apply them in a moment but for now, I felt it was important to dispel this myth. In the photo at the top of this section, you’ll see Taylor Swift is not only wearing blue shadow but also black liner and mascara. You’ll also see her eyes look beautiful. Don’t trust the myths. You could wind up missing out on a really great look. Of course, blue shadow and black mascara might not work for everyone. Try it out. If you like it, wear it. If you don’t, try something else. There are lots of options out there so you will be able to find something you’re comfortable with eventually. Most shades of purple look absolutely stunning on blue eyes. The same can be said for most shades of blue and most shades of any color on the list above. 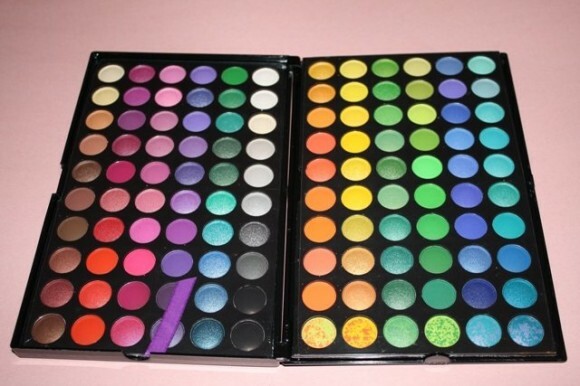 Invest in a decent sized makeup palette and experiment to see what you like best. If you want to really go for a bold look, try bright, stand out colors to draw a lot of attention to your eyes. Bright pinks, fuchsia, bright blues and bright purples can create a dynamic look that will make your eyes pop in a big way. The technique you’ll use to apply your eye shadow depends on a few different things but the big one is the shape of your eye. We talked a little bit about makeup for different eye shapes in this article so I would recommend finding your eye shape there, taking a color family from the list above and using different shades in that color family to apply your makeup. Here’s a pretty simple idea you can try in step by step format though to try out some color ideas. This is also a pretty great every day look if you’re looking for something simple. Step One: Prime your lids with a bit of eye shadow primer. Step Two: Apply a shade of silver shadow to your lid, starting at your upper lash line and continuing to sweet the silver shadow all the way up to your eyebrow. You don’t want to use anything with too much shimmer. Too much shimmer will be distracting instead of complementary. Step Three: Apply a shade of lavender shadow from your lash line to the crease of your lid. You don’t want to see a distinct line in the color so make sure you blend the colors well. Step Four: Apply a shade of lavender shadow in a sort of v-shape that starts in the middle of your eyelid and ends at the outer crease of your eye. Again, you don’t want the lines to be distinct so make sure you blend the color well. Step Five: Apply either a dark gray eyeliner or a charcoal eyeliner to your upper and lower lash lines. Step Six: Finish up your look with a little mascara and you’re all set. There are a lot of different things you can do with this look, especially in terms of color. Experiment with different colors and see what you like the most. The bottom line is that your eyes are your eyes and you’re the only person that will know what you feel comfortable with. Lighter shades of purple are often considered the best shades for blue eyes but in my experience, darker shades can work as well if you’re careful with how you apply it. If you really want to draw a lot of attention to your eyes, try using either black eyeliner or dark brown shades. Charcoal is my personal favorite eyeliner color for every day use and might be worth a try for you as well.